All right, I know folks love Christmas movies. A lot of folks love Christmas movies. But that two week Christmas in July spree a couple of weeks ago? I saw someone tossing a scarf over their shoulder and I almost wept. It isn't that I don't love Christmas, because I do. I can deck the halls with the best of them. Or rather, I used to be able to deck the halls. Then yours truly had a brilliant plan to raise more cash for our summer theater, the Cliffside. "Why don't we do A Christmas Carol, and make it a fundraiser?" I asked innocently at a planning meeting a few years back. Our artistic director, Dimitri Traietti, reacted negatively to the idea, but I talked him into it. I. Talked. Him. Into. It. In other words, it's all my fault. Well, this last Christmas Carol, not all of that was my fault. Who knew our new Scrooge was a nightmare? And that issue with Mrs. Cratchitt. You can't blame me for that. No, all that happened, and was written about in A Christmas Peril, that wasn't my fault. But doing the show, and making it an annual event that pretty much made me a zombie through the holidays? The show that kept my halls from being decked, since my cat didn't pull his weight and put up the tree? That's my fault. And that's why Christmas in July made me cry. I was just getting over last year's A Christmas Carol, and wasn't prepared. Tell me, given all that happened last year, can you blame me? Friends, how do you feel about Christmas in July? 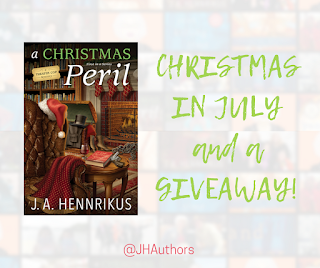 Let me know below, and I'll pick a winner of a copy of A Christmas Peril on Sunday, July 22. I do not mind it but prefer my Christmas in December. I like the Christmas in July sales! christmas in July sounds fantastic to me! Back in 60/70s, my dad rigged up a speaker system out by our pool when we lived near Palm Springs. I was in High School. Daddy would put a stack of LPs on his old stereo and crank it on ....every weekend. We never knew what album might come up next...from Don Ho singing Tiny Bubbles to Jim Reese or old Gene Autrey singing country to Strauss to Hark the Herald Angeles Sing Or it’s beginning to look a lot like Christmas...lol. I can visualise us bbqing chicken, the smell of suntan lotion and hear jingle bells! I prefer it in December. We just had a Christmas in July party, with white elephant gifts. It's nice to think of Christmas in the middle of the heat of the summer - as long as the stores don't start carrying Christmas items. But I read Christmas fiction year round. I think Christmas in July is fun, but only as far as watching Christmas movies and listening to Christmas episodes on Classic Radio. Christmas or Chanukah it makes no difference. It's always time to have a holiday. No matter when it occurs we have to dig deep into the budget to hand out gifts to four married children and TEN grandkids ages 20 down to 2. I think about hosting a Christmas in July, maybe next year. Thanks for the opportunity. I love Christmas cozies. I prefer to keep Christmas in the winter. It's too hot to have it in the summer. I love Christmas in July, and in December. It's always fun. I must admit I find the whole Christmas in July thing is getting out of hand. I can't get into Christmas in July. It doesn't feel like Christmas when it's 90 degrees out. We need something to look forward to in December. I prefer Christmas in December. I love Christmas in July. It's always fun to watch holiday movies, read holiday-themed stories, and start thinking about all the fun to come in December. Christmas in July is not really something I take much notice of. When I walked into my local thrift store and saw all those holiday displays I wanted to cry. We don't get a long enough summer. Please don't rush the seasons! 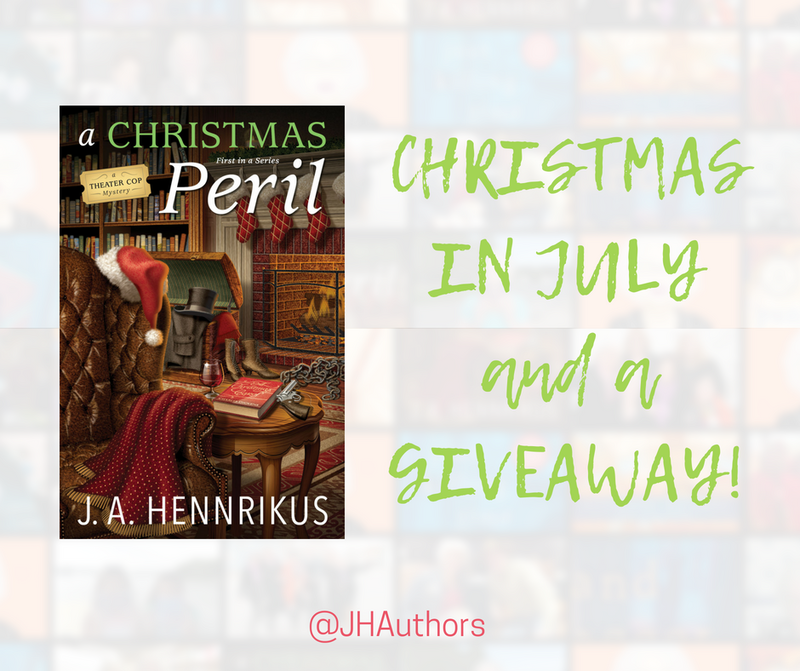 Love the Christmas in July books any time of the year! Watched a lot of the Hallmark movies that have been on lately. For me Christmas is in December not July. I love Christmas in July. I watch holiday movies and read holiday books. I hate cold weather, so Christmas in July is perfect for me. I am guilty of watching and enjoying Christmas movies in July. Sometimes I need a reminder of that special time of year!